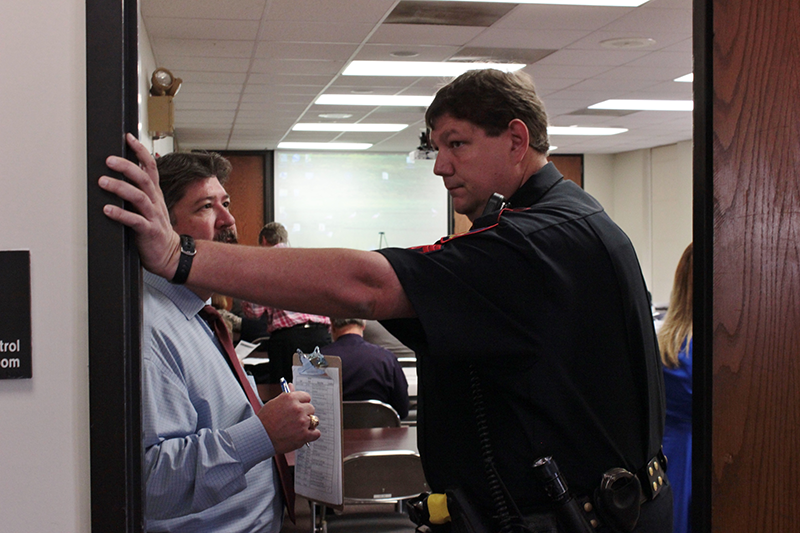 Harris County constable protecting secret meeting of engineers and developers from potential disruption by overly polite defenders of Buffalo Bayou. Photo by Dave Fehling, KUHF. The unsurprising vote was 18-1 Monday, Oct. 27, 2014, in favor of stripping the forested banks, dredging, channelizing, and rerouting the last natural stretch of Buffalo Bayou as it flows past our great Memorial Park in the middle of Houston. The Harris County Flood Control Task Force, dominated by engineers, builders, architects, bankers, developers, and realtors, voted behind closed doors on secret ballots to spend $4 million in tax money to make our wild Buffalo Bayou a bigger drainage ditch for development of west Houston. That seems to be the gist of it. 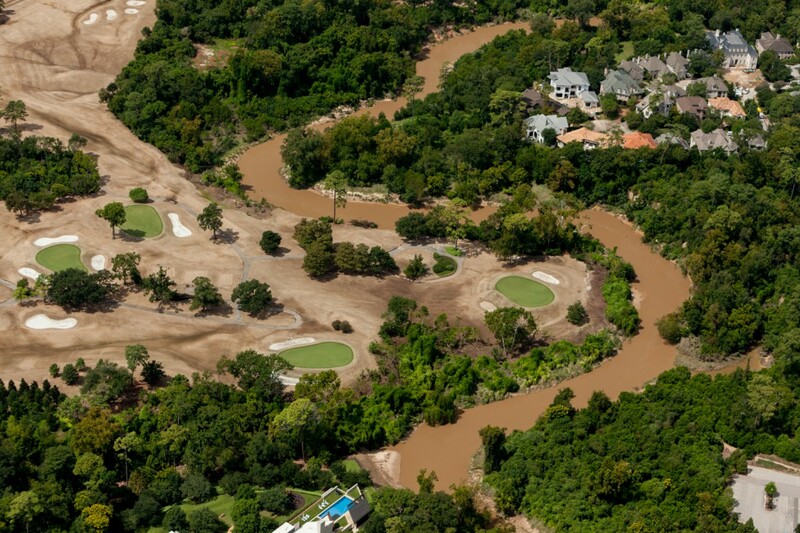 Along with helping the River Oaks Country Club shore up the banks of its currently being renovated golf course. The club, which owns half the property in the project, is contributing one-third of the $6 million cost. Whether the experimental project will work is another question. But hey, if it washes out, it’s only beautiful public parkland and a stretch of the river that teaches us the healthy benefits of what natural rivers do. Evelyn Merz, the Sierra Club representative, cast the lone opposing vote. Representatives of the Citizens Environmental Coalition and the Audubon Society did not attend the meeting, as far as we could tell. The representative of the League of Women Voters apparently voted in favor. Task Force Chairman Ranney McDonough of McDonough Engineering refused to allow Merz to speak, though she tried. “It wasn’t always like that,” recalls Frank C. Smith Jr., past chairman of the task force, who was allowed into the meeting as a guest of Merz. In the past, says Smith, the task force was more evenly balanced between development and environmental interests. The thirty-one members of the little-known task force, founded in 1973 through the efforts of citizen activists like Smith, are appointed by the Harris County Commissioners’ Court. It is an advisory body, and the vote Monday was symbolic. A committee of the task force, appointed to “investigate” the controversial project, voted 5-1 in favor of it Oct. 15. Again, Merz was the only negative vote. The Army Corps of Engineers is considering whether to issue a permit to the Harris County Flood Control District for the project, known officially as the Memorial Park Demonstration Project. 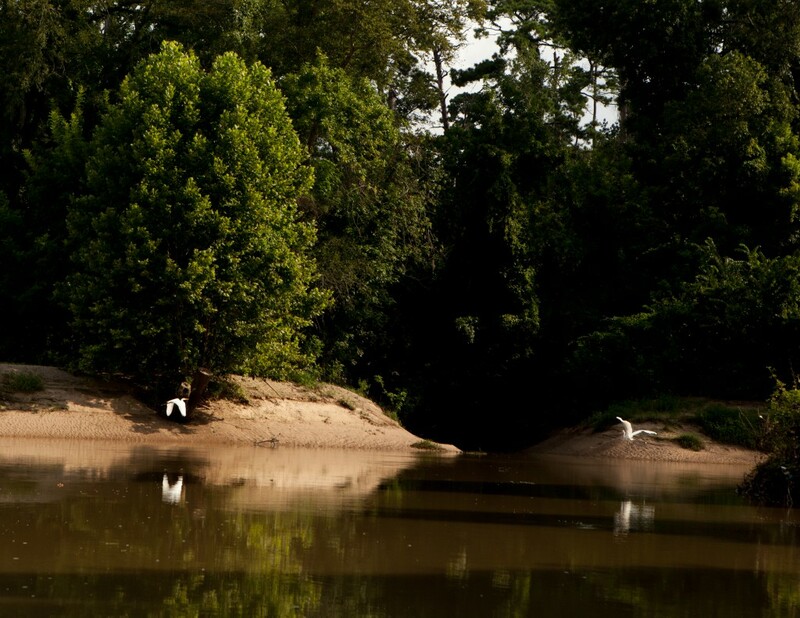 The Houston city council has already voted to waste $2 million on destroying an irreplaceable natural resource in the middle of the city. However, councilmembers must eventually vote on whether the test experiment (the often-failing techniques haven’t been proven to work on a river like ours) is a legal taking and use of public parkland according to state law. So let your city council representatives know what you think about that. Listen to Dave Fehling’s report on the meeting on KUHF 88.7. The chairman of the Harris County Flood Control Task Force has closed the upcoming Monday afternoon meeting during which the task force will vote on the project to destroy the last natural stretch of Buffalo Bayou in Houston. Task Force Chairman Ranney McDonough said in a phone call late Thursday afternoon that the doors to conference room 100 in Flood Control District headquarters, 9900 Northwest Freeway, will be closed to the public and anyone who tries to attend the meeting without authorization will be turned away. 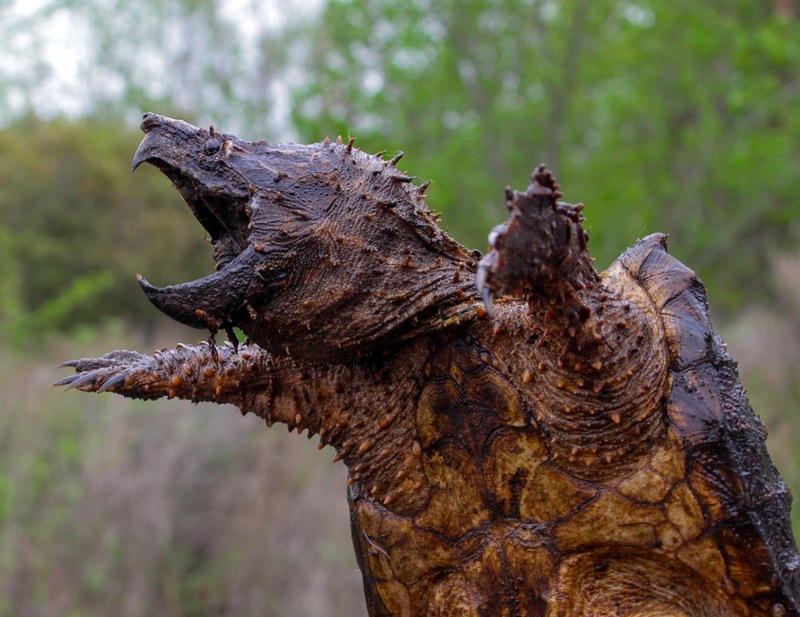 The alligator snapping turtle lives in Buffalo Bayou. It is listed as threatened in Texas. Photo by Ashley Tubbs. McDonough’s legal authority to close the meeting is dubious, based on the Texas Open Meetings Act. The task force, appointed by the Harris County Commissioners Court, makes no binding decisions, and the vote Monday is symbolic. The purpose of the task force, founded in 1973 as a result of citizen activism, was to balance the interests of flood control, economic development, and preservation of our diminishing natural resources. Opponents of the $6 million project, officially known as the Memorial Park Demonstration Project, will be attending the 2 p.m. meeting despite McDonough’s declaration. All are urged to attend to witness the proceedings in defense of the bayou. We must shed light wherever we can on the absurdity of this wasteful enterprise and those who are responsible for it. Read the rest of the editorial in Gray Matters in the Houston Chronicle. Great egrets flying past Memorial Park. The banks here will be bulldozed, and the bayou filled in and a new channel cut further south through River Oaks Country Club property. Photo by Jim Olive. Raise your hand if you ever heard of the Harris County Flood Control Task Force. 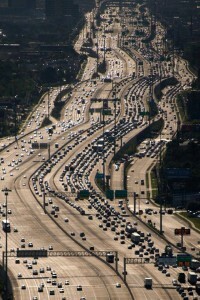 The Katy Freeway in west Houston, widest freeway in the world and major conduit of stormwater into Buffalo Bayou. Engineers voting for bulldozing Buffalo Bayou work on Interstate 10 and other highway and paving projects as well as public drainage systems. Try looking on the Internet for any mention of this 31-member semi-secret committee and you’ll find almost nothing except for an occasional reference in someone’s bio and a brief note on the website of the Bayou Preservation Association. Founded in the 1970s to create “a community collaboration of engineers, developers, and interested citizens,” according to the BPA, the task force is now mostly a collaboration of engineers and developers, as is the BPA. Last Tuesday, Oct. 15, a county task force committee looking into that question voted 5-1 in favor of spending $6 million to wreck the last natural stretch of Buffalo Bayou in Houston, a perfectly healthy 1.5 miles of wild bayou flowing in and around our Memorial Park. The project would destroy riparian forest crucial to the health of our water, to erosion and flood control. Riparian zones are increasingly being recognized as wetlands that should be federally protected for our own health and survival. 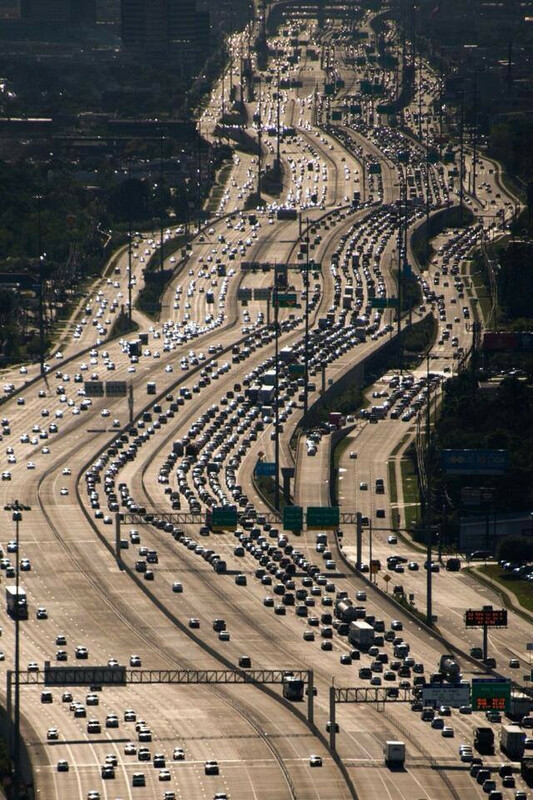 On Monday, Oct. 27, 2014, at a public meeting in the Harris County Flood Control District headquarters, 9900 Northwest Freeway, the full flood control task force will be voting on whether to go ahead with the controversial project. Update: The chairman of the task force, Ranney McDonough, said in phone call late Thursday afternoon to Save Buffalo Bayou that the doors of the meeting will be closed and the public will be turned away. But we are going anyway. The flood control district declined to provide us with the names of the current members of the full task force, suggesting we contact the Harris County Commissioners’ Court since the commissioners’ court created and appoints the task force. No response to those emails by press time. Update: Courtesy of one of the members, we now have a reasonably current list of the members of the task force. And generally we know that of the 31 positions approved by the commissioners, about nine seats go to engineers and architects, another eight go to developers and builders, another two go to business groups, three or four go to government agencies, and another seven go to environmental or civic groups or individuals. Several positions are empty. We will do our best to provide their contact information. These task force members need to be contacted and informed. Please let them know of your opposition and why. In addition, please note that Harris County Precinct 4 Commissioner Jack Cagle, who represents Memorial Park, is up for election on Nov. 4. Not In. In a Meeting. On the Other Line. As of this writing, it is unknown how many of the five task force committee members who voted in favor of the bulldozing project have seen this part of the bayou. We’ve made fruitless calls and left messages and talked to one engineer on the committee who voted in favor of bulldozing and channelizing the last wild bayou. He’d never seen the area to be destroyed; he thought there was no vegetation there. This is not a disagreement between conservationists. This is a battle between conservationists on the one side and developers and profiteers on the other. The influential Bayou Preservation Association, which was instrumental in creating this project and which continues to be its strongest advocate, is no longer a preservation group. The president of the BPA works for the Energy Corridor District, the development agency for the Katy Prairie in West Houston, one of the fastest growing areas in Houston and source of Buffalo Bayou. The BPA board is heavy with representatives of major engineering, construction, and landscape design companies. On the board is a representative of KBR, the engineering contractor for this bayou project. Representatives of the flood control district sit on the advisory board. This area is not suffering from severe erosion. See below. Edible smart weed and young box elder, black willow, and sycamore building a new riparian forest on a sandy marsh of Buffalo Bayou in Memorial Park. Great white egret in the background. Photo taken on October 6, 2014, by Susan Chadwick. Susan Chadwick with Save Buffalo Bayou will be on the radio program Houston Matters at 12:30 p.m. tomorrow, Wednesday, Oct. 8, discussing the project to destroy the last natural stretch of Buffalo Bayou in Houston. Steve Hupp, director of water quality for the Bayou Preservation Association, which helped create and is the primary promoter of the $6 million dredging and channelizing project, will also be on the show, along with Dave Fehling, Houston Public Media’s State Impact reporter for Energy and the Environment. The number to call is 713-440-8870. Craig Cohen is the host of the popular KUHF radio show. Tune in to 88.7 around 12:30 p.m. to hear the live discussion. But if you miss that, you can hear the show online anytime by going to the Houston Matters website. Should be a lively debate! 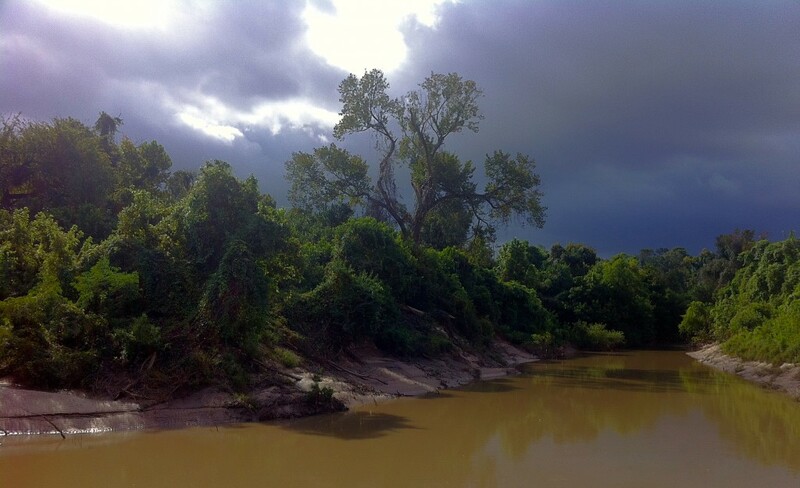 Thunderstorm approaching on Buffalo Bayou Monday morning, Oct. 6, 2014. Looking upstream with the forest of the River Oaks Country Club on the left and Memorial Park on the right. All this will be bulldozed and a new channel cut for the bayou. Where are we now and what should you do? 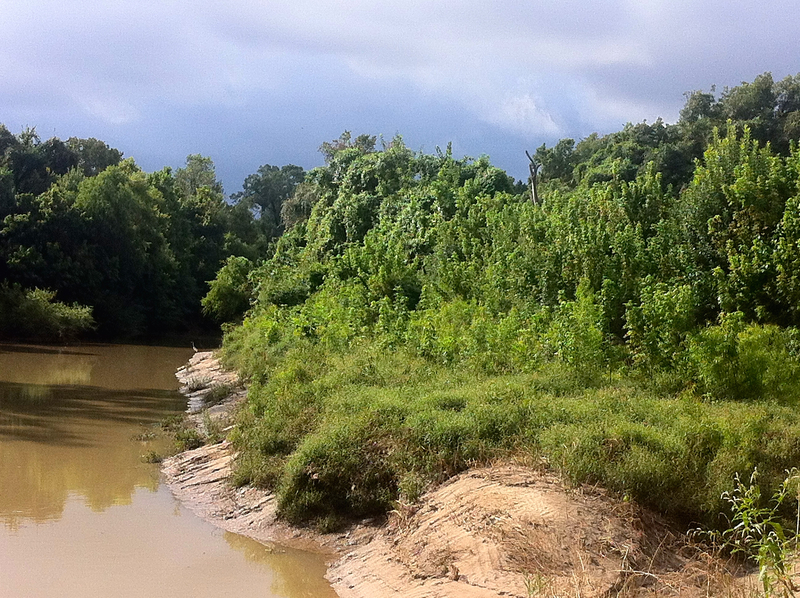 The Harris County Flood Control District has applied for a permit to bulldoze most of the riparian forest and vegetation along both banks of more a mile of the last remaining stretch of natural Buffalo Bayou in the city. This is our bayou as it passes by Memorial Park. Also targeted are the tributary and high bluffs of the Hogg Bird Sanctuary, as well as other ancient cliffs and prehistoric sandstone used in the past as water crossings by buffalo and people. The project would excavate, fill, grade, and artificially rebuild the banks; dredge, deepen, and reroute the bayou channel, damming tributaries. Hundreds of trees will be cut down, many of them riparian species too small or too young to be counted by the district’s inappropriate tree survey. The shading tree canopy will be removed (project proponents claim there is no tree canopy! ); the water temperature increased. The soil, packed with protective, binding roots small and large, will be dug up, tossed around, and compacted by heavy equipment. Wetlands and lovely sandy beaches will be obliterated along with the colonizing and stabilizing plants that have taken root there, a crucial stage of the natural process of building the riparian buffer so important to water quality, flood and erosion control. All of this and more violates best management practices for riparian zones. It will destroy the bayou’s ecosystem. And this is a project developed and promoted by the Bayou Preservation Association, supported by the Memorial Park Conservancy. The River Oaks Country Club, which owns the entire south bank of the bayou project, has killed the grass on its golf course, along with some vegetation on the high banks, in preparation for redoing the golf course. Photo on Sept. 20, 2014, by Jim Olive.